A debt management is a contractual agreement between two parties (debtor and creditor) to safeguard their own interest. In simple words, terms and conditions defined by lender to the debtor to repay outstanding debts with pre-defined interest rate and duration of repayment. Probably, this is the most important lesson one has to learn in life in order to live with economic freedom. Almost everyone has to take loans or debts in life to fulfill the basic needs. But the repayment could be a serious issue. 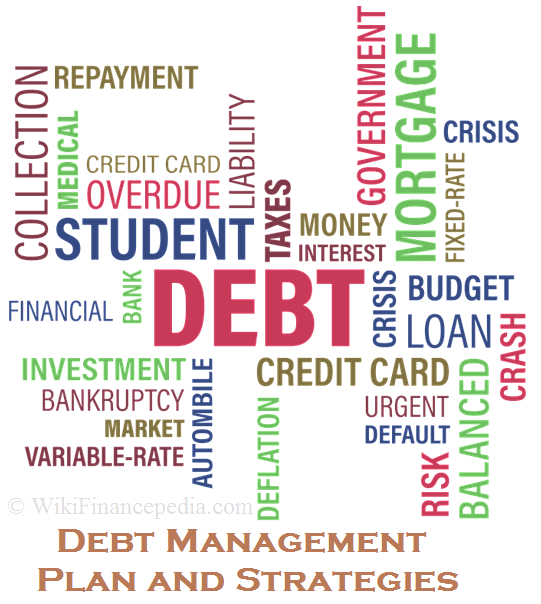 There are various debt management strategies followed by creditors. For example: banks are smart enough to sanction only that amount of loan to a person which he can easily repay in form of the EMIs. This is one of the form of public debt management strategies followed by banks. 1. Character: The overall reputation of a borrower in financial matters. It is measured by credit score. In India, this score is maintained by Credit Information Bureau (India) Limited or CIBIL. So, it is generally called as CIBIL score. Its scale goes from 300 to 900, while 900 being the best score. For the approval of loan, the CIBIL score should be more than 700 (generally). 2. Capacity: It reflects the capacity of the borrower to repay the loan. Debt-To-Income Ratio (DTI) is used to calculate the capacity. It is calculated by dividing total monthly debt by gross monthly income multiplied by 100. 3. Capital: It is the money which a borrower put toward the investment for which he is getting a loan. One the typical example is down payment on the purchase of a house. 4. Collateral: It is the security for a loan. There are two types of loans – secured loans and unsecured loans. The loan against property and a car loan are the examples of secured loan and the car and house itself are collaterals. 5. Conditions: It is the terms and conditions of the loan itself. Loans are easily sanctioned when the rate of interest is high. But this affects the borrower severely. 1. Take only the utmost necessary debt – Take it as a primary thumb rule, never take debt which you can avoid. Always remember, the loan money is fake money, as said by the famous author and a businessman Mr. Robert Kiyosaki (author of the famous book – Rich Dad Poor Dad). This is the best debt management tip one can give. 2. Let debt work for you and not against you – In cases where people take the loan to do some business or investment, they must understand that they have to earn out of that loan and not lose at any cost. Generally, people think that the prices on real estate property grow faster than the interest they would be paying to banks if they take a loan on that property. But this is not the case always (not in most of the cases). Real estate investment business have its own complexities, so just avoid jumping into that business if you are not free enough to give a dedicated time to deal with those complexities. 3. Keep on working around monthly budget – Probably, this could be your best friend while dealing with debt management. Until you save enough money for your survival and repayment of debt, it will only increase the problems. Set the priorities and stick with them. 4. Negotiate with creditors – Even a decrease of 0.25% interest rate can help in big way; generally, it covers scores of EMI value. This is incredible positive effect in long-term. And the bank reduces the interest rate easily upon request. If they deny, then you always have option of balance transfer (BT). In that case, other bank will take over your loan on lower interest rate. Home loan repayment is the biggest issue in an individual’s life. Remember, it will take 15-20 years to pay the loan in full if you repay it though EMIs. So, best debt management plan here could be selling that home when its value is increased, and buy a new home of fewer prices. This simple tips could give a big leap towards dealing with debt management. One should learn and understand the seriousness of debt management. It is always easy to apply for loan but it is difficult to repay it. You should build your own debt management plans and come-up with some debt management strategies which will not only help you in growing your wealth but it will also help to maintain your peaceful life. In other words, those people who fails to draft right path toward debt management will lead to either losing their own wealth or worst thing is, it can lead towards bankruptcy.